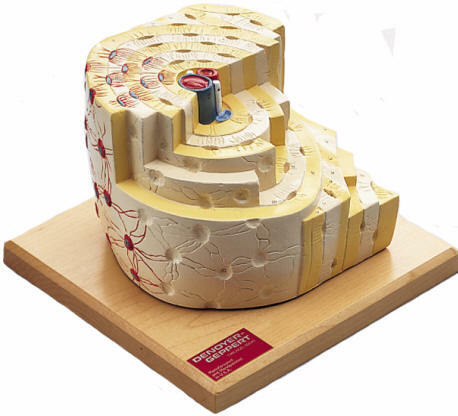 This 80X model depicts a section of lamellar bone, showing the typical structure of a tubular bone. Planes are shown in cross and longitudinal section through all levels of the bone and bone marrow. Typical elements are easily identified and help in understanding the structure and function of the Haversian systems. This representation graphically illustrates the individual bone components including spongy and compact substance, endosteum, cortical substance, oseocytes, Volkmann and Haversian canals. 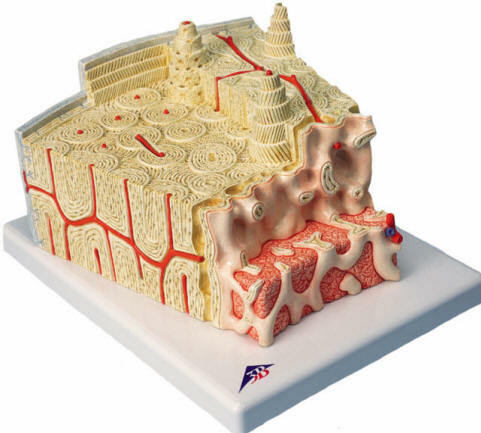 Promoting an understanding of the skeleton at the tissue level, this is a hand-detailed vinyl model of a pinhead-sized fragment of compact bone that has been magnified approximately 500 diameters. One complete haversian system, and a portion of two others is depicted in cross section, with lamellae cut away step-wise at various levels. Mounted on a hardwood base, the Bone Structure Model is provided with an identification key. Please Note: This is a hand made, custom made that is made to order. Please allow 4 weeks for delivery.